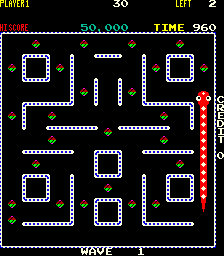 Nibbler is a classic 80s arcade game that is easy to learn, and difficult to master. 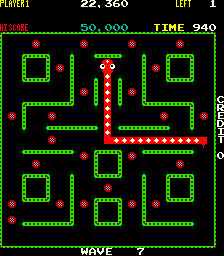 Created by Rock-ola, Nibbler first appeared in arcades in 1982. 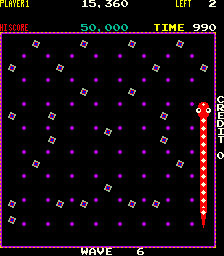 The game was notable as featuring a 9 digit score, and players soon began the quest to be first to reach a billion points. In this guide you will find strategy and tips provided by Tim McVey (featured in the documentary, “Man Vs. Snake“), as well as a guide to the different revisions of the game. Nibbler starts off slow, but as you complete waves the gameplay speeds up. 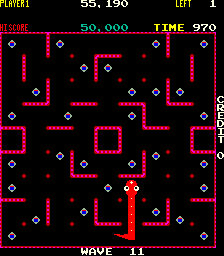 Navigating the maze, and avoiding your own tail becomes a challenge. The game features 32 distinct waves that repeat with color variations. Once you reach Wave 99, the game will infinitely repeat waves 80-99. Below are tips and strategies to get you started. Wave 1 begins at a leisurely pace, and it is easy to avoid your ever growing tail as you complete the maze. Waves 3,6, and 9, introduce an open play field with only the outer wall. Make sure to leave yourself room on the edge of the play field as you hunt down the “croutons“. You will need that extra space to avoid your lengthy tail. Wave 7 is a faster version of the first wave, with a new color scheme. Beginners will find Wave 11 to be a challenging test of reflexes. The corners of this maze are traps that will steal your lives if you are not careful. The open maze of Wave 16 is a formidable challenge, with few spots to “stall” while planning your next move. 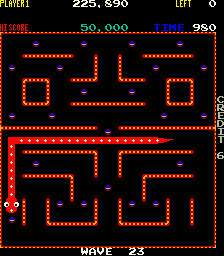 Attack the center of the maze first, which is much safer to navigate with a short tail. 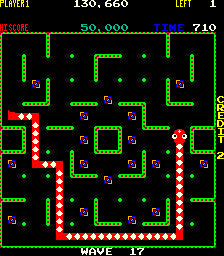 Wave 17 features the same difficult maze as wave 11, but with different “crouton” positions. Wave 18 is a bonus stage where the “croutons” are replaced by the initials of one of the programmers. Start on the right side and move top to bottom of the open play field, working your way to the left side of the maze. Wave 23 may look similar to Wave 2, but notice the small opening between the top and bottom parts of the maze. Plan accordingly! Since the life counter for Nibbler only displays 2 digits, hexidecimal digits are used to display 100+ lives. 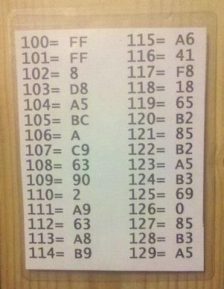 The digits are somewhat random, so use Tim’s handy chart on the left to decode the display. Ready to go for the Billion? Develop patterns that are reliable. Remember to let Nibbler take turns for you, saving your strength for the 40+ hours of gameplay ahead. Build up your lives so you can take breaks. Good Luck! Nibbler 9 – The last version of Nibbler released by Rock-ola. The significant change is that after Wave 32, the “croutons” regenerate if you lose a life. That makes difficult waves even harder, as you have to start over each time. 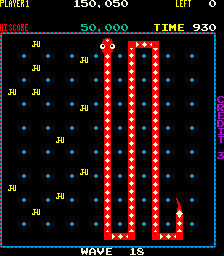 Nibbler 8 Olympia – Olympia licensed Nibbler and decided it was too easy, so they cranked up the difficulty. This is the hardest version of Nibbler. Wave 1 is much faster, and Nibbler grows quicker than in other versions. Bonus lives are rewarded every 8 waves, instead of 4. Just in case that wasn’t hard enough, you only start a game with 2 lives! 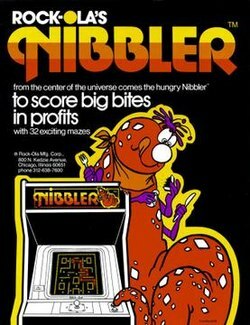 If you feel you’ve mastered Nibbler already, play this version for a real challenge. 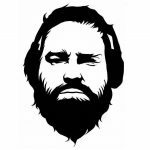 Nibbler 6 – The first version of Nibbler released, this is the version preferred for marathoning. When you lose a life, the “croutons” you have already snacked on do not regenerate, making it easier to finish a difficult wave. Nibbler 6 w/ music – This version of Nibbler is identical to version 6, except there is partial music from a different Rock-ola game, Pioneer Balloon. The exact reason that some Nibbler boards have a music rom from Pioneer Balloon is not known. They might have been boards that were converted either at the factory or by operators, or the inclusion of the music might have been intentional. However, one of the original programmers, John Jaugilas, has stated in the past, “No music on Nibbler.. period. 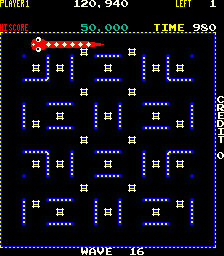 No questions or doubt about it.” The MAME team addressed the issue by creating a specific romset based on version 6 w/music (nibblerp.zip).